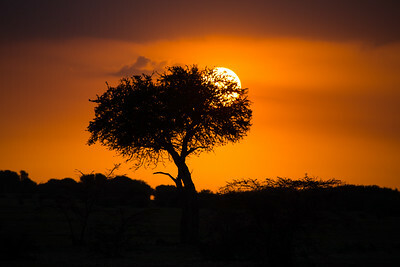 The sun rises over the horizon in the Masai Mara in Kenya. 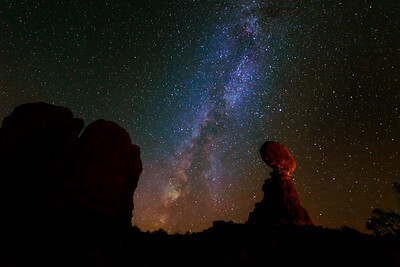 Balanced Rock in Arches National Park and nearby butte at night rest below the Milky Way and its galactic center. 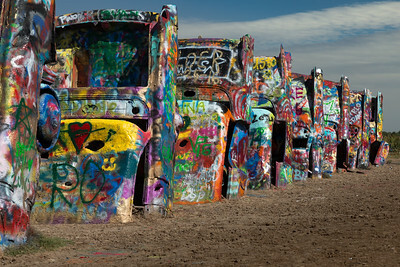 The colorful Cadillacs in Amarillo, Texas get new paint jobs everyday as visitors bring their own spray cans and leave their artistic touch. 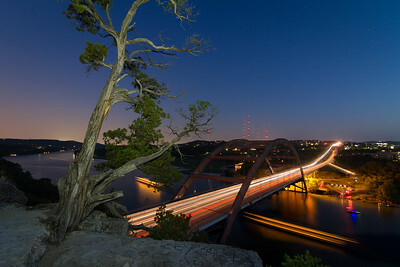 Climbing the path up to the ridge overlooking the Pennybacker Bridge in Austin is a test of patience and firm footing. But once you reach the top, the view makes it all worthwhile. Along the top growing up through the rocks is a tree that leans over the edge. While it makes a great overlook, it is nothing you want to climb. As the sun sets, the lights below and in the distance begin to glow. The quiet stillness of the evening air makes for a great moment to reflect on the day and appreciate the beauty of the many colors below. Easy does it on the path way back down to the highway. 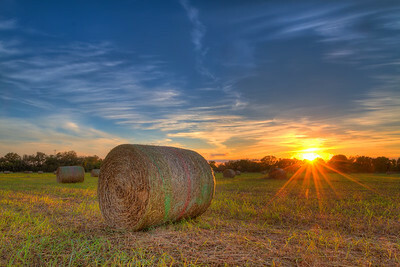 The golden colors of a sunset accents the golden colors of hay bales in a local field, while the sun creates a golden star effect as it sets. There’s nothing quite like a romantic walk around the Eiffel tower in Paris. That is, unless you are in Las Vegas. 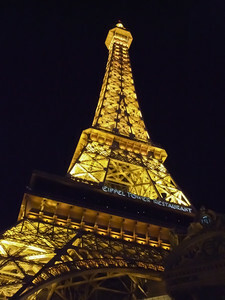 There you will find a half scale replica of the French original in front of the Paris Las Vegas hotel/casino. While these two vary in height, there are many similarities between them. 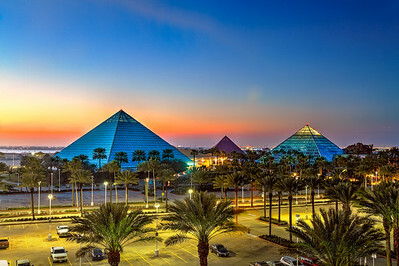 Both have an enclosed observation deck for safety as well as a glass elevator to admire the stunning vistas on the way to the top. For a quieter, more intimate experience without sacrificing the view, visitors can dine in elegance at the Eiffel Tower Restaurant on the 11th floor. Several years back, my wife and I did the Las Vegas weekend trip and dined in their restaurant, which I highly recommend. The view is spectacular, as you watch the Bellagio fountains dance in front of the setting sun and the famous Las Vegas lights. This was a handheld shot from a small point-and-shoot. I’ll take the big guns if I ever go back. 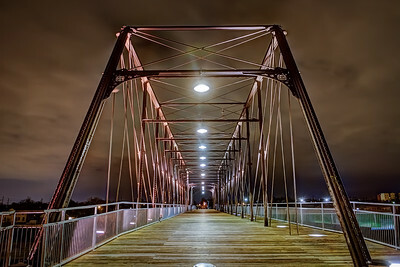 Hays Street Bridge in San Antonio, Texas at night. 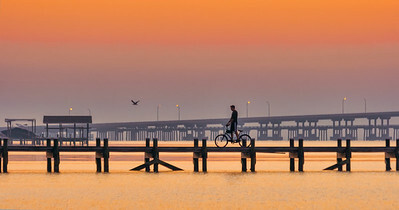 As the morning brightened, the joggers left, replaced by this lone cyclist at this surf side park. 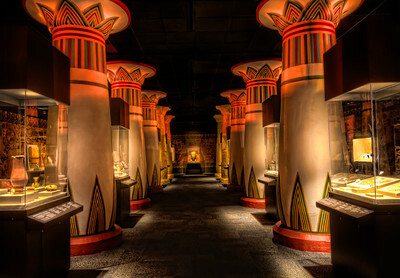 One of the most popular new exhibits at the Houston Museum of Natural Science is the 10,000 square foot Hall of Ancient Egypt. This new permanent exhibit is made up of pieces on long-term loan from other museums. 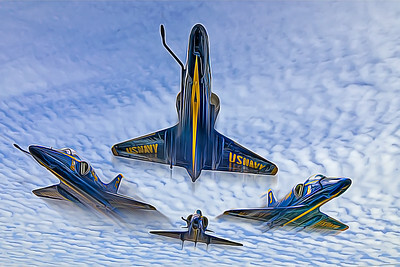 My fondness of airplanes is no secret. Like a woman window-shops for shoes she can't afford, I shop over airplanes I'll likely never fly in, let alone ever own. 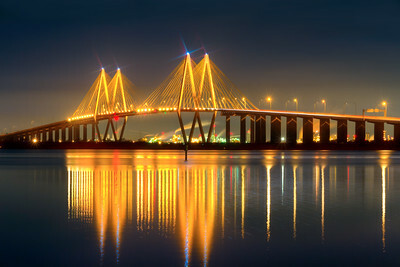 But it's nice to dream and enjoy these beauties through short visits and lasting photos. This beautifully restored North American T-6 Texan (with the Navy designation SNJ-5) was at the recent Wings and Wheels at the 1940 Air Terminal Museum with it's 600 horse power Pratt and Whitney R-1340 "Wasp" Radial engine. 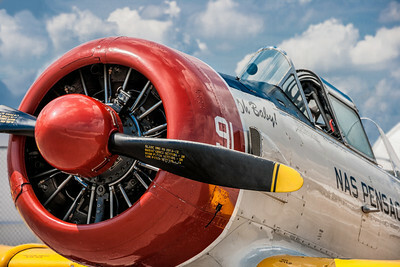 Some lucky person won a charity raffle for a ride in this historic World War II era aircraft. I knew I should have bought more tickets. I have had the fortune to stay at the Moody Gardens Hotel a few times. Each time I stay, the fog has been terrible in the morning and evenings. So much so that you could not see the pyramids from the hotel, even though they are just across the parking lot. On my last visit, the sun was setting and I was able to take this one view. The next evening, when I actually had more time to shoot, the fog prevented any view at all. I was lucky to get this one opportunity from the window of my room. 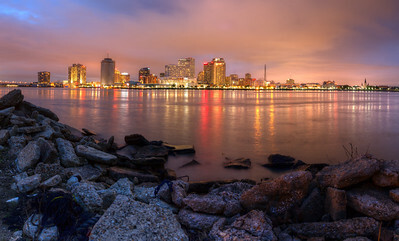 On a photo trip to New Orleans, it took us some time to find a spot on the Mississippi without docks or barges, giving a clear view to the skyline. You may not be able to tell it from this page, but for more detail, click on the image to visit the print site. You can click on that new image for closer previews. 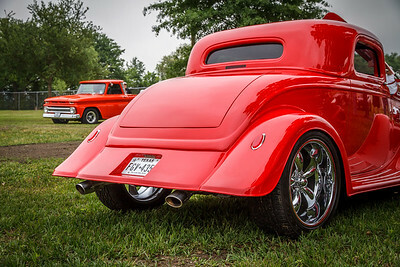 I'm encouraged to try more of these on our next photo trip. 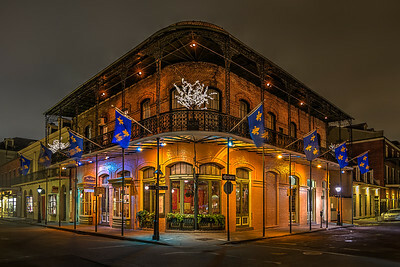 The French Quarter is the oldest neighborhood in the city of New Orleans. 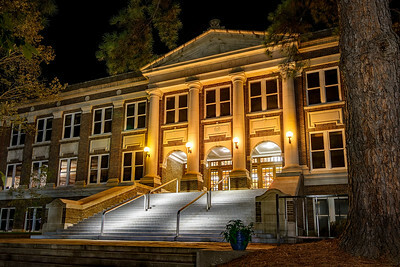 Most of the present-day historic buildings were constructed during the late 18th century, during the city's period of Spanish rule, and reflect Spanish colonial architecture.